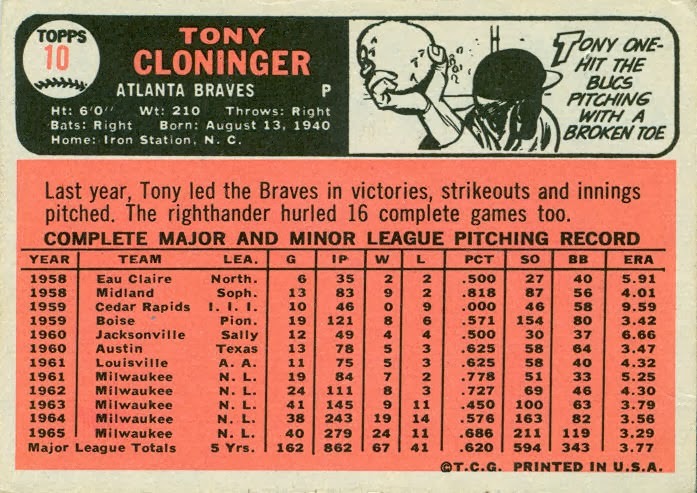 As with 99% of the lavender-colored cards (Braves, Angels), Tony Cloninger appears capless. Those teams had just changed their names, and being card #10, Tony had no shot at having an updated photo. Cloninger was signed by the Milwaukee Braves in 1958, and made his big-league debut in June 1961, essentially replacing Bob Buhl in the rotation. 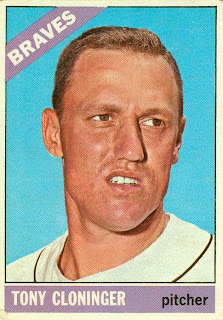 After a few seasons pitching behind aging veterans Warren Spahn and Lou Burdette (and a stint in the bullpen during 1963), Tony was the ace of the Braves' staff from 1964-66. He won 19 games in 1964 and 24 in 1965, but his most famous moment was hitting 2 grand slams in a game against the Giants in 1966. His career began to fade in 1967, just as Phil Niekro established himself as Atlanta's new ace. 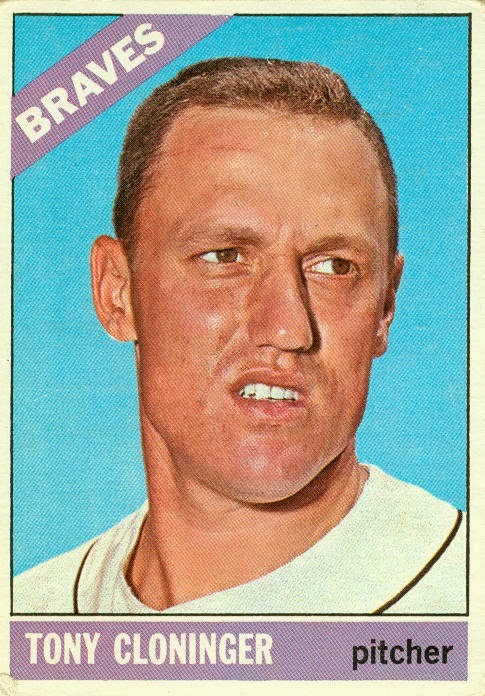 Cloninger was traded to the Reds in June 1968 (along with pitcher Clay Carroll and infielder Woody Woodward) for pitchers Milt Pappas and Ted Davidson, and infielder Bob Johnson. In his 3 full seasons with Cincinnati, Cloninger posted records of 11-17, 9-7, and 3-6. During spring training in 1972, he was traded to the Cardinals for 2nd baseman Julian Javier. Tony was released by St. Louis in late July, and was re-signed by the Braves, although he spent the remainder of the season in triple-A, before retiring. 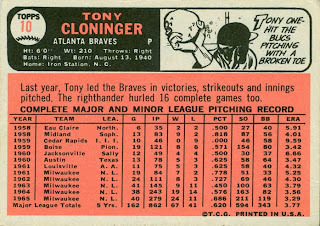 Also check out Cloninger's 1967 card. Ruiz was with the Reds from 1964-69, and saw most of his playing time as a backup 2nd baseman, although he played some at shortstop in '67 and '69. He is probably best-remembered for stealing home in a September 1964 game against the Phillies, precipitating the Phillies' late-season collapse. 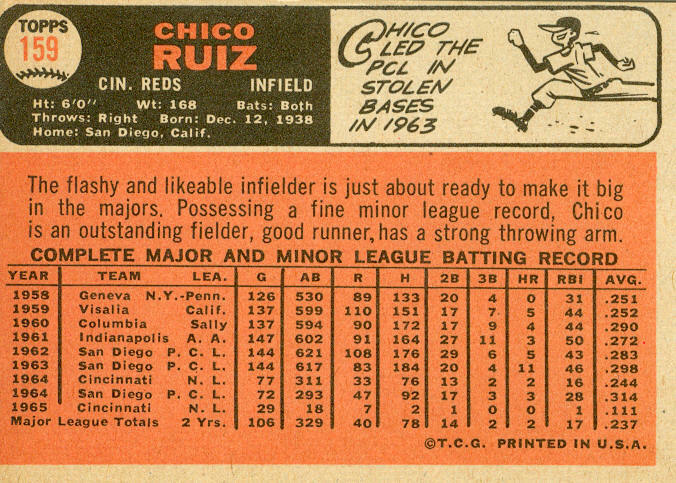 Hiraldo "Chico" Ruiz was signed by the Reds in 1958, and played in their minor leagues as a shortstop (1959-62), then split time between 3B and SS in 1963. 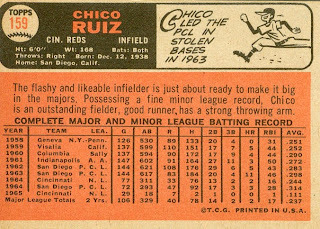 Ruiz made his major-league debut with the Reds in April 1964. He started the first 20 games at 3rd base for the Reds, but was sent back to the minors in mid-May, where he remained until late July. While in triple-A, he played mostly 3rd base, and a little shortstop. 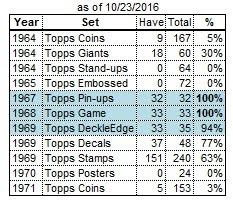 Chico returned to the Reds in late July, and soon found himself starting 23 straight games at 2nd base (presumably Pete Rose was injured). 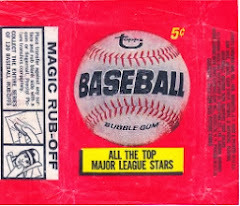 When Rose returned, Ruiz started 21 of the Reds' final 23 games at 3rd base. 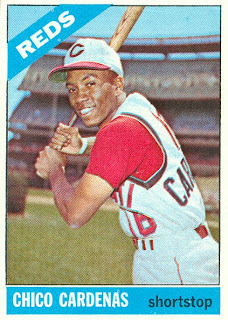 With rookies Tony Perez (1965) and Tommy Helms (1966) joining the Reds, Ruiz was relegated to utility infielder status for the rest of his time in Cincinnati. 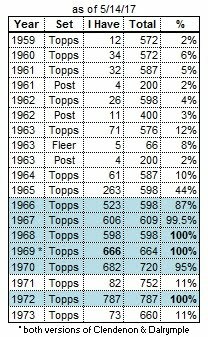 He got the most playing time in 1967, when he started many games at 2nd base while various other infielders were on the DL. 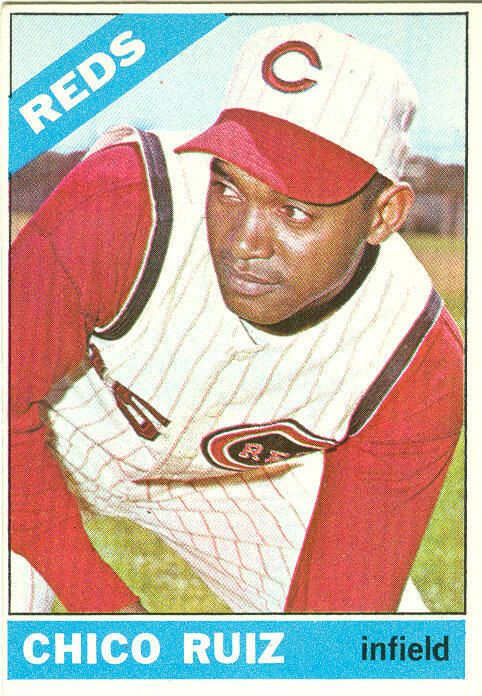 Ruiz was good-natured about his utilityman status, and after his extended playing time in 1967, he told his manager to "bench me or trade me". After the 1969 season, Ruiz was traded to the Angels (with outfielder Alex Johnson) for pitchers Pedro Borbon, Jim McGlothlin, and Vern Geishert. Chico played 2 seasons with the Angels as a utility infielder, but was released after the 1971 season. Shortly after he was signed by the Kansas City Royals, he was killed in a car crash in February 1972 in San Diego.